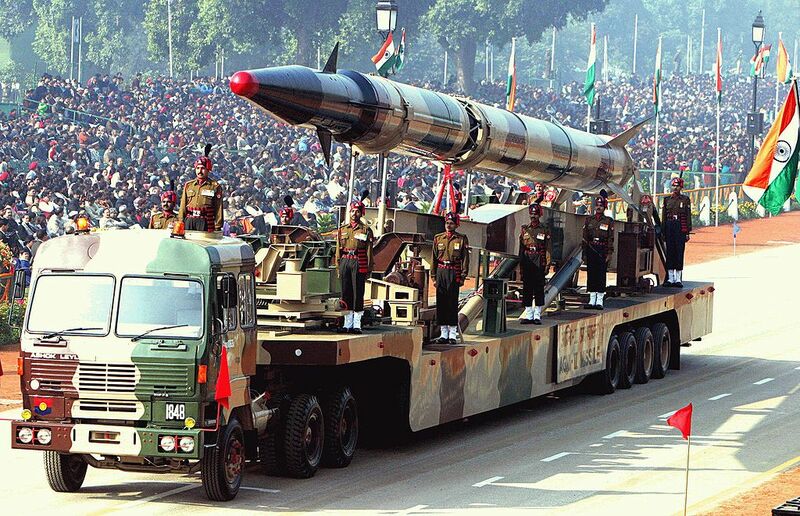 The Indian Army's Agni II missile on parade. The “opportunity costs” of nuclear weapons is thought provoking concept in Pakistan, North Korea and India; where development of nuclear weapons take place against a backdrop of prevalent poverty and unmet basic needs. Therefore some prominent nuclear physicists in Pakistan i.e. Dr. Pervez Hoodbhoy and Dr. A.H. Nayyar are on insistence that development of nukes by Pakistan is a main source of its economic deprivation and Paranoia. For them, nuclear testing of 1998 was the main reason of economic crises in Pakistan. This is exactly a guns versus butter debate—a selection between taking care of the people who serve OR the equipment they need to contest and prevail in current and future conflicts. Nuclear weapons and the debate on the necessity for such weapons have persisted for several years. The more opinions against it, the more and more countries yearn to possess these weapons and demonstrate their power. So we have to discover those benefits which are of such significance that a country prefers to divert a huge finance from public sector to become a nuclear capable state. The rational of developing the nuclear weapon was that Pakistan must have a self-reliance to ensure its security. After the hefty losses in 1948 and 1965 wars and debacle of 1971, Pakistani leadership comprehended that none of great power is going to support Pakistan in time of crisis against any Indian aggression. Therefore self-reliance was the crucial idea of Pakistan’s policy makers to make sure that only Pakistan should be responsible for defending their country against any Indian offensive. We must have to understand that being a nuclear power is crucial for our survival and sovereignty. Preserving and improving national security is vital to the national interest, and expenses from state budget in support of this objective are permissible. For a country like Pakistan, having the nuclear bomb means that it has the ultimate strategic defense. Wars are bad for the economy and nuclear deterrence is a best tool to avoid wars. A short conventional war between India and Pakistan would cost Islamabad U.S. $ 350 million per day. Now one can easily estimate economic deprivation if Pakistan had to face another 1971 debacle without having any nuclear weapon. In contrast to conventional warfare, nuclear deterrence has made wars between nuclear states rationally non-viable. The possession of nuclear weapons serves not only military and political but also economic functions. The acquisition of nuclear weapons appears to be associated with long-term decline in conventional military spending. This is acutely accurate in case of Pakistan. Pakistan’s conventional military expenditure is constantly on decline right after the nuclear tests. Military expenditure (% of GDP) in Pakistan was measured at 5.3 % in 1998, according to the World Bank. In 2012 that expenditure was 3.13 %. This is a clear instance that nuclear capability served as a major cause to diminish military expenditure in Pakistan. Moreover, we have to not forget that Pakistan nuclear establishment is also progressive in peaceful use of nuclear technology. Use of nuclear technology for peaceful purposes especially in energy sector can generate some of the largest economic benefits due to their size and the number of workers needed to operate the nuclear plants. The 100 nuclear units in the U.S. are generating substantial domestic economic value in electricity sales and revenue up to $40-$50 billion each year. Canada’s nuclear energy industry has revenues of about $6.6 billion. Pakistan can also achieve the same feat by the extent of civilian benefits from nuclear weapons spending. Pakistan has the experience of operating nuclear technology, which spans over four decades. Pakistan has the qualified manpower and professionals and it is now constructing a fourth and fifth nuclear power plant. Pakistan has reached a remarkable milestone in scientific research by becoming an associate member of the European Council for Nuclear Research (CERN). Pakistan can utilize nuclear science and technologies for its national programmes for the benefit and improvement of the society especially in energy sector. Thus, Pakistan will be able to facilitate other countries of the region in peaceful uses of nuclear energy and this cooperation will generate revenue to stabilize our economy. The constructive uses of nuclear science are visible in applied sciences, food, agriculture, biotechnology, human health, energy and industry. Today Pakistan Atomic Energy Commission PAEC has numerous institutes to render facilities for Research & Development in these benign areas. The major institutes which are performing research in nuclear physics are Pakistan Institute of Nuclear Science and Technology (PINSTECH); Nuclear Institute of Agriculture (NIA); Nuclear Institute of Agriculture and Biology (NIAB); Nuclear Institute for Food and Agriculture (NIFA); National Institute for Biotechnology and Genetic Engineering (NIBGE) and National Institute of Lasers and Optronics (NILOP). These all institutes are sharing their part in social inspiration. I feel wrought up when people say, what is the use of being a Nuclear power when people are dying of poverty? This is the fact that social development should be the first and primary focus but cutting down on our nuclear budget is not the answer. So we have to understand that Pakistan’s economic deprivation is not because of its nuclear weapons but these weapons are the source that provides channels to take economic strides and develop. Hence economic progress can also be achieved as Pakistan accomplished its nuclear feat; all we need is devotion and sincerity of purpose.